Urban Gondola For Bucharest: Most Ambitious Cable Transit Plan Ever? Rendering of a potential urban gondola station in Bucharest, Romania. 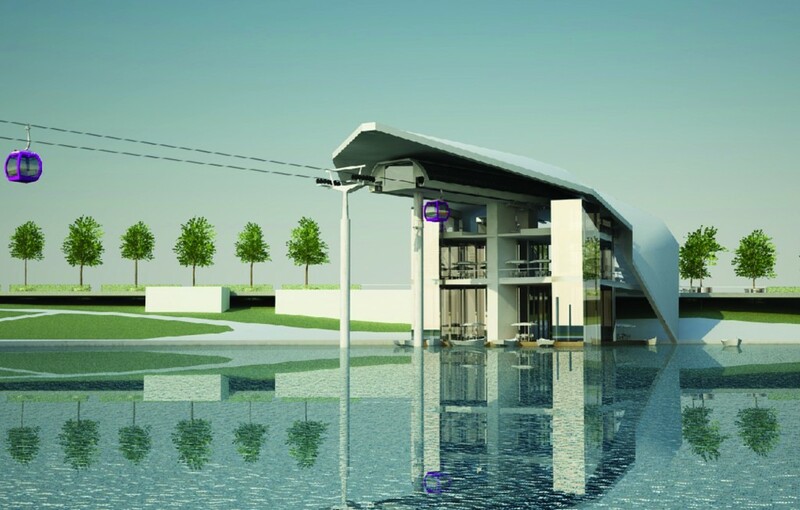 Reports surfaced yesterday about plans for an urban gondola transit system in Bucharest, Romania. If the reports are true, the system will be one of the most ambitious and robust Cable Propelled Transit systems the world has ever seen. The system would be 10 km long, have 6 total stations (4 intermediary) and three corners. Regarding system capacity, the linked-to report states that “a single cable car will (carry) 1,500 people per hour.” This, of course, is impossible so we can only assume a translation error and the actual capacity of the system will be 1,500 pphpd. Technical drawings of the Bucharest Gondola. For higher resolution, download the original by clicking the image. Firstly, note how the system closely follows a series of rivers and lakes. This is a great example of how cable is able to exploit the natural features of an urban area that technologies such as Light Rail and BRT cannot. This is a point I made previously in an article I wrote for Urban Omnibus. It isn’t a condemnation of those two other technologies, but it is to point out one of cable’s great advantages. Secondly, while it is never explicitly stated, all information suggests this system will utilize MDG technology. At a speed of only 5 m/s (18 km/hr), one can calculate that an end-to-end trip would take roughly 38 minutes (including intermediary dwell times). Admittedly, that’s a long time to travel only 10 km. But it’s worth considering how long it might take someone to travel an equivalent route using existing road and transport infrastructure. As this system is “leapfrogging” the road network by using the river contour, there could actually be significant time savings here. If anyone has any thoughts on this issue, they would be more than welcome. Now to be frank, that number seems absurdly low. There’s clearly something missing here – station architecture, possibly or something else. But at a per km cost of just €2m, it does remind one the Vinpearl Land gondola in Vietnam. So despite the fact that I’m incredibly suspicious of that price tag, I’m willing to play along until I find reasons to do otherwise. Nevertheless, this is a system that will be well worth following.